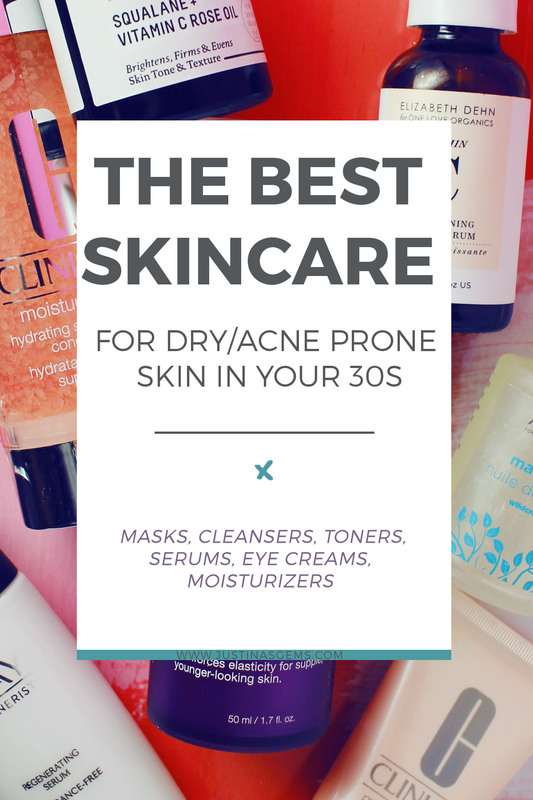 Like many people in my age group (early 30s) I am battling more than one thing at the same time when it comes to picking out skincare: I have dry skin and I am also acne prone…AND I want stuff with anti-aging ingredients. You’d think a girl would get a break in between pimples and wrinkles right?! It certainly doesn’t always feel that way! 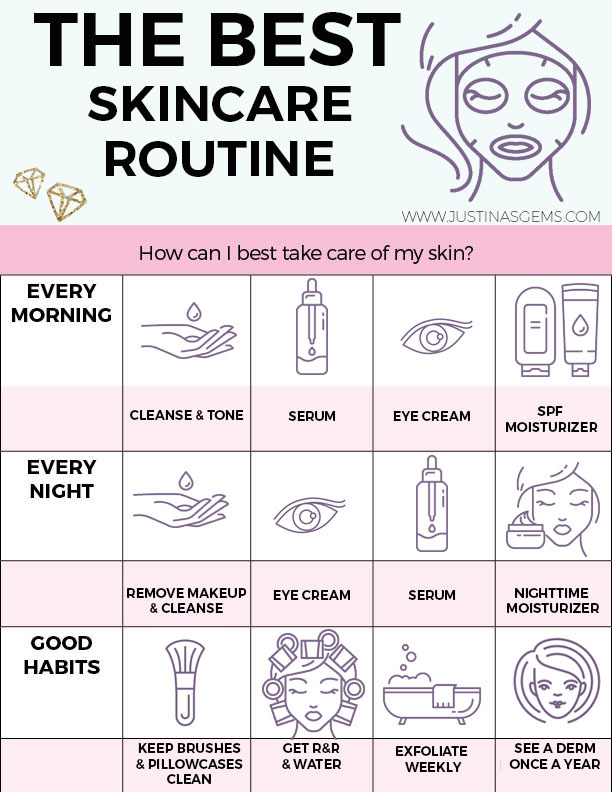 For this post, I compiled my favorite skincare in all categories with several options and linked you to where you can find them at the best price. We’ve got masks, cleansers, toners, treatments, and more! If it’s something I’ve reviewed, I linked you to the review too! The pictures are clickable and lead you straight to purchase. Happy shopping! A treatment mask is so good for keeping acne at bay. I love to target my acne, my dryness, and any other concerns I might have by multi masking. The pore purging masks go on my t-zone while the hydrating ones go on my forehead and cheeks. Treating the problems by targeting them and using separate products in those areas is the key! Ren Glycol Lactic Radiance Renewal Mask: I love the slight citrus scent and how soft and perfected my skin looks and feels after use. I see a huge improvement in my skintone, texture, firmness and radiance. Sky Organics Dead Sea Mud Mask: This is a great mask for multi-masking in my t-zone. Any oily areas and clogged pores immediately dry up when I use this. Osmosis Polish Enzyme Firming Mask: Lactic acid and cranberry are used to exfoliate and smooth the complexion. I love the way my skin feels clean, refreshed, and smooth after using this. Farmhouse Fresh Guac Star Soothing Hydration Mask: Nothing beats the soothing and refreshing feeling of this mask that hydrates and moisturizes on a deep level. Clinique Moisture Surge Overnight: This is my all time favorite moisture mask to wear overnight when my skin needs a huge drink of hydration. When I wash my face, I often double cleanse. I’ll use a makeup remover or cleansing oil to take the day away. And then I’ll cleanse my skin with a gentle cleanser to remove any residue from the previous step. I’ve found so many great options over the years. I always hear people say you can just use olive oil as a cleanser, but in my experience you MUST use a gentle cleanser after oil cleansing or it’s a recipe for breakouts. Olay Daily Facials: This is such a great low cost option for when I just want to remove everything in one swipe. They’re water activated so great for travel too. I keep them in every bathroom! Paula’s Choice Perfect Cleansing Oil: This cleansing oil uses sunflower, coconut, meadowfoam, jojoba, and grapeseed oils to replenish skin while rinsing off that day’s makeup. I sometimes use it in the morning too because it’s so hydrating! It Cosmetics Bye Bye Makeup: Perfect for all skin types, this deep cleans and removes all traces of makeup without drying or irritating skin. I love this! One Love Organics Vitamin B Enzyme Cleansing Oil: An eco beauty product with the amazing scent of pineapples, this is an absolute joy to oil cleanse with. The luxury experience comes with a high end price tag but it’s so worth it. Stemology Cell Refresh Hydrating Cleanser: A perfect, gentle cleanser for hydrating and soothing dry, red, and sensitive skin. The ingredients are all natural, and there are amazing anti-inflammatories like aloe vera, chamomile, comfrey, and eucalyptus. Clinique Facial Soap Mild: I love using this with a skin cleansing tool like the Clarisonic or Foreo Luna. It’s a very simple cleanser that is so gentle but still deep cleans my pores. If you’re not using a mask to gently exfoliate a couple times a week, it’s a great idea to use a toner that will provide some light exfoliation. My goal with this step is to sweep away any surface grime and dull flaky skin that is keeping my skin from looking its best. When I can remove that layer, smoother and clearer skin emerges and my skincare has a better chance to absorb. So of course, any products targeting acne or anti-aging are going to work their best. This is a step I really shouldn’t ever skip with my normal/dry skin and especially since I sometimes get acne and have anti-aging concerns. If I ever skip a step in my skincare routine because I’m tired or lazy, it’s usually this one though. Overall, I take excellent care of my skin so when I get acne it’s usually because I skipped this step too many times. Using super hydrating creams without toning regularly is a recipe for disaster. I can also tell when my skincare seems to be sitting on my skin and not soaking in that I really need to make time for this step. Clinique #2 Toner: My first skincare routine ever started with a visit to the Clinique counter. I like this brand’s three step approach to cleanse, tone, moisturize. This is a simple one that suits my normal/dry skin very well. Pixi Glow Tonic: A cult favorite, mild, hydrating toner. I don’t think you can go wrong with this one. Ren Ready Steady Glow Daily AHA Tonic: I love the press down applicator on this that allows you to saturate your cotton round with just as much as you need. This is formulated with a pH between 3.5-4.5 for results without the irritation. Tarte Knockout Tingling Treatment: This is a newer product to my rotation and I’ve used it with amazing before/after results. It has a slight vinegar scent and leaves my skin tingling after use like the name would suggest. But it’s AMAZING on hormonal acne and cleared my skin up super quickly when I was suffering from a breakout. Once your skin has been cleaned and exfoliated, it’s a good time to target your skincare concerns. Mine are adding more moisture to my skin, keep acne at bay, and keeping the beginnings of any fine lines and wrinkles far away. Adding moisture to my skin through my skincare and also by drinking lots of water softens up any aging (at least for now! I’m 31!) but it can also clog my pores if I’m not careful. Clinique Moisture Surge Hydrating Supercharged Concentrate: This delivers a huge moisture burst to your skin but dries down to feel like nothing at all. The consistency is like a water-gel. I’m on my third bottle! Kiehl’s Powerful Strength Line Reducing Concentrate: This product is perfect for using morning or night. It’s newly formulated with Vitamin C so it has amazing brightening properties. Under makeup, it is beautiful because it really fills in my pores while it does its thing. Farmacy Honey Savior: I apply this to any rough patches or super dry areas on my face. The corners around my mouth is one place! It’s amazing on dermatitis. Clinique Acne + Line Correcting Serum: This serum is a powerhouse and is able to target both acne and lines at the same time without drying out skin. It is somehow able to have hydrating properties at the same time as combatting acne. It’s perfect for those of us in the 30s crowd who are sick of pimples! Olay Regenerist Regenerating Lightweight Moisturization Face Serum: Olay knocks it out of the park with low cost skincare that works amazingly well. I was intrigued just reading about this before I even tried it but was super impressed once I used it. I love using this as a hydrating makeup primer as well because it fills in my pores. Also love that it’s fragrance-free! One Love Organics Vitamin C Serum: It leaves my skin glowing and feeling amazing, and I don’t need much more of anything for skincare when I use this. It’s got a great ingredient list of oils that deeply moisturize skin. One thing that really helps every woman look younger (or makes her look older) is how her eye area is looking. If my eye area is moisturized and firm, my entire look is softer. That is true whether I’m wearing makeup or not! I’m looking for something on the richer side that has a lot of moisture. I’ve tried so many eye creams, and lots of great ones but these are my three favorites. Olay Eyes Deep Hydrating Eye Gel: I love the pricetag on this, plus its soothing and cooling properties. Kiehl’s Midnight Recovery Eye: This is ultra hydrating and I LOVE that it comes in a squeezy tube so I only take what I need. Clinique All About Eyes: This is my absolute favorite eye cream of all time. It’s my holy grail for keeping my eye area soft and smooth and it’s definitely what I compare everything to when I decide if I like it! The final step to any good skincare routine is an awesome moisturizer. I have many favorites. At night I tend to reach for something moisturizing and on the thicker side. During the day, I try to reach for something lighter that absorbs quicker so I don’t have to wait for it to dry before applying makeup. I also look for something with SPF! If I wear a moisturizer that day that doesn’t contain SPF I make sure to use a makeup setting spray that has it. Nothing ages a person like not using sunscreen! Dr Jart+ Ceramidin Cream: I’ve had several samples of this and need to invest in a full size. It is such a treat for my skin and has a lot of moisture while being great on super sensitive skin. Clinique Moisture Surge 72 Hr Auto-Replenishing Moisturizer: This is the newest remake of the Moisture Surge line. I am a huge fan of the original formula of this moisturizer, and it seems like this is almost exactly the same albeit a little bit thicker. Biossance Squalane + Vitamin C Rose Oil: I am a huge fan of using oils and when I use this one I often use it as my serum and moisturizer in one. It works super well as a light oil that doesn’t leave me greasy. Acure Marula Oil: This is a super nice oil and the price tag is even better. It’s very inexpensive with a high end feel. Read more about it here. Paula’s Choice Ceramide-Enriched Firming Moisturizer: I am loving this as a last step for daytime use before makeup. It has firming qualities for younger looking skin. I love using this right after my firming facial tool to amp up my results! Not using SPF will age a person much more quickly. I used to think I could use SPF in my foundation and that I’d be covered for the day. Wrong! You need to reapply sunscreen throughout the day for it to continue to keep your skin safe from the sun’s rays. For that reason, I’ve started using SPF not only in my moisturizer and primer, but also in products that I can use repeatedly in the day like makeup setting spray, that won’t disrupt my makeup. Murad Invisiblur Perfecting Shield Broad Spectrum SPF 30 PA+++: This is an amazing anti-aging treatment, primer, and invisible SPF all rolled into one. I love applying this before makeup and even putting it over makeup for a mid-day refresher. It goes on like silk too! COOLA Face Sport SPF 50: I’m a huge of this brand’s formulas whose ingredients are cleaner than most. This is a very nice lightweight moisturizer that is great for sunny days. COOLA Makeup Setting Spray SPF 30: I love that this is 70% organic and can be reapplied as needed throughout the day. I’m regularly pulling something this or the Supergoop version from my purse to get an extra spritz of protection during the day! Colorescience Beauty of Protection: This brand has a lot of great products with SPF. This one is a powder sunscreen that comes in an easy to apply container with a brush applicator. It’s great for dusting on an extra layer of SPF as needed! I’m a huge fan of anything that actually works and will help me fight the very early signs of aging and combat acne! I’ve found a lot of things that are not practical for me and LOTS that are super expensive. There are two I love and use every day that I’ll share with you! NuFace Mini Facial Toning Device: I’ve been using this machine for about a month every day and so far, I’m swearing by it! I’m only 31 so I’m not looking into any kind of aggressive treatments for anti-aging at this point. But as I see tiny fine lines or my skin losing a bit of elasticity, I’m ready to up my skincare routine around every corner. I took before pictures so soon I’ll be able to compare and see how far I’ve come! Foreo Luna: I started out as a total Clarisonic fan but once I discovered this, I haven’t gone back. I love not having to replace a brush head (or having to disinfect them!) and that I can still get squeaky clean skin. This device is made from silicone and is very soft and gentle on my skin but I can tell it’s working to deeply cleanse. It’s a must especially when I’m breaking out! Do I really use ALL of these?! I’m just like anyone else and I shop for a good deal or use what’s available to me. My skin changes with the seasons and sometimes I’ll put something back that’s not working for me and I’ll reach for it again the next time that season comes around. 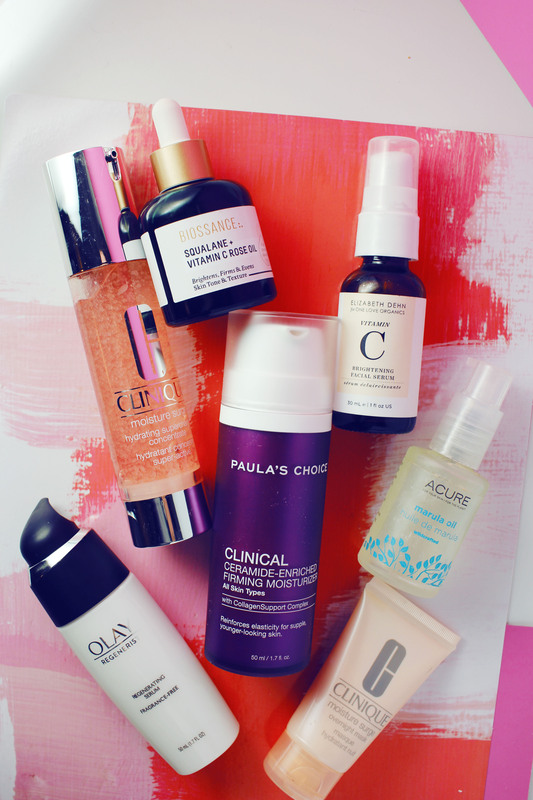 So yes, each of these products are tried and true and I love them all! I use one or two out of each category at a time. I definitely rotate through what I have or what I need to purchase, so I’m not using 39145583 products at once!